ALoveForTravel | I love traveling, planning to travel, reading about travel, watching about travel, and hearing about travel so much, I decided I should write about it as well. These are my experiences and words of advice I have gathered along the way. I am not a fan of the interior rooms on cruise ships. Out of the many cruises I have been on, I have only stayed in one interior room. The main reason I don’t care for them is because I like to wake up to see the natural sunlight shining around the drawn curtains. It helps me to wake up. I could probably sleep the cruise away if I was in an interior room and I didn’t set an alarm to wake myself up. I once had someone give me some good advice for getting an interior room but still getting some natural light (sort of). They said before you go to sleep set the TV on the ship’s outside view channel and mute it. Because it is a constant, real-time view, usually out the front of the ship, it will be dark at night and get lighter as the sun rises. I thought that was a genius idea! Well, Royal Caribbean apparently found it to be a genius idea as well because in 2014 they began offering interior rooms with a virtual balcony. 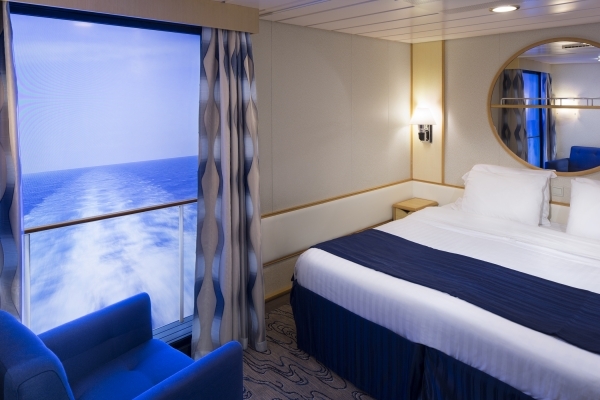 When they refurbished Navigator of the Seas they incorporated the concept in a select number of interior rooms and Quantum of the Seas set to launch in November will have a virtual balcony in all the interior cabins, 373 to be exact. Voyager, Adventure, and Explorer of the Seas are slated next to receive the upgrade. The concept is basically the same as what I described above, but on a much more high-tech level. An 80-inch, High-Definition display will be framed to look like a real balcony that will stretch nearly from floor to ceiling and from wall to wall depending on the room. What will be viewed on that display is a real-time view of one of the ship’s cameras giving the room’s occupants a virtual view of the ocean on sea days and the surrounding port on port days. How fantastic is that?!?! To make this amenity even more realistic, actual sounds of the sea in real-time will be piped in to enhance the authenticity. (There will be volume control) A-mazing!!! Another interesting feature the virtual balconies will include is a banister to offer a feeling of safety. Apparently, the display is so HD that it was making people feel like they could fall right into the ocean! There was a lot of details that the creators of these virtual balconies had to deal with that frankly, I got bored reading about, including how to keep people from feeling seasick. But basically, there are a lot of really smart, tech-savvy people working on this project to bring it to all of us cruise lovers and make the interior room more appealing. Now Royal Caribbean is not the first cruise line to come up with this virtual-view concept. When Disney launched the Disney Dream in January 2011, many of the interior rooms boasted a virtual porthole. The virtual portholes display a real-time ocean view on a 42-inch monitor and once in a while a popular Disney character peeps in. Of course, it all boils down to price. I found that on average for a 7-night Caribbean cruise a virtual balcony room was about $100 per person more expensive than an interior room. Interestingly, I found the virtual balcony room to be the same or slightly higher in price for the lowest category ocean view room. Honestly, I think if I was paying the same price I would rather have a window with an actual view, but I have not had a chance to see a virtual balcony yet so my opinion might change once I have. So tell me, what do you think of this virtual balcony concept? Would you like to stay in a virtual balcony room? For more information on booking a cruise in one of these rooms please visit www.alovefortravel.com or email me at tmay@alovefortravel.com. One of the main reasons I got into the travel business was to share my love of travel and to inspire that love of travel in others. By reading my blog posts, it is probably no secret that I have a fondness for the Caribbean. I have fellow agent-friends who have a similar fondness for Italy or France or England. I so enjoy talking with others who love travel as much as I do, and that is the reason that most of us travel professionals do what we do. When I have the opportunity to hear about a vacation that I helped plan and book for clients it makes this “job” seem even less like a job. I get to go on vacation with every one of my clients, even if it is only in the planning stages. But when I get to hear about and see pictures from that vacation, that extends the experience even more! Recently, I had a client contact me about booking he and his wife for an adult-only vacation to some place warm. Having been friends with them for quite a few years, I was fairly confident that I knew their traveling style and what they might have in mind. After combing through many possibilities, I sent them a few options and they finally settled on Secrets Aura in Cozumel, Mexico. They are both avid participants in the blogging community, and I was quite certain I would see a post on their vacation from at least one of them. Sure enough, Mandy did not disappoint. I wanted to share her post here for you all to read as well. As I said previously, I love hearing about the vacations I help to create. I hope you enjoy reading about it almost as much as I do.